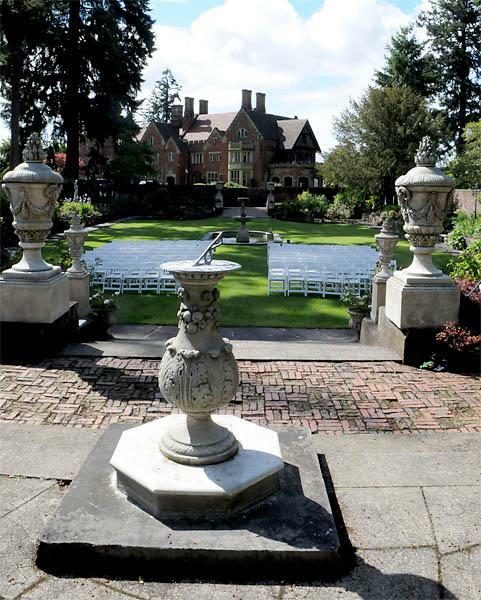 Rent Thornewood Castle Inn | Corporate Events | Wedding Locations, Event Spaces and Party Venues. Thornewood Castle is both an indoor and outdoor wedding venue. Weddings and receptions at Thornewood Castle can take place in our sunken English garden, inside in the Great Hall and Ballroom, or out on the grounds for a wedding overlooking the water. If you want an amazing garden wedding, we can set up your big day on the steps in our "secret" garden, surrounded by antique brickwork, sculpture and fountains, and huge bursts of flowers. Or, if you prefer a waterfront location, you can get married on the immaculate lawns overlooking American Lake. Receptions can be set up on the grounds next to the Loggia (a covered porch) or inside in the ballroom. Thornewood only hosts one wedding on a given day, so you can be sure that we can accommodate your wishes for your wedding day. No matter the weather, you will have an easy "Plan B" at Thornewood. We have the space to accommodate a wide variety of requests. Limousine parking, a horse and carriage, helicopter landings, sea plane, fireworks over the lake - we have had them all. Our castle staff will handle the setup of both your wedding and reception tables and chairs that we provide and answer questions and provide any assistance needed as related to use of Thornewood Castle. We also provide many non-standard amenities as part of our wedding package, so you save money and have less to worry about when planning your big day. We allow your choice of caterers, subject to their meeting all health code requirements (and we haven’t had prior bad experiences with them). We can recommend some caterers to you, if you would like references. Your caterer will need to provide their food service tables and any other tables required (we can also rent you and set up these extra tables for a small extra fee).